We had a couple of hours on our last day in London, and asked our friend Paul what his favorite street in London, right now. 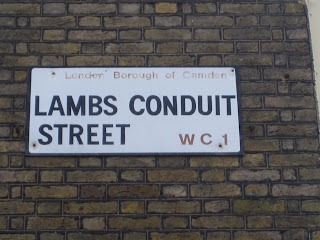 Lamb's Conduit in the Bloomsbury neighborhood was his first choice, so off we went. We stopped in at Oliver Spencer, a really lovely store that carries men's and women's clothing, all of it great. Then we had a quick lunch at the Spanish restaurant on the corner, Cigala , and a perfect macchiato at The Espresso Room (Paul said this is probably the best espresso in London). This area is a block away from the Coram Fields Park , which I had high hopes for, since its website looks great. From the site, it appears to be a country farm in the middle of the city, but instead it's a bit sad, with a couple of bunny rabbits in hutches, and some chickens and goats in gloomy pens. But it is a big open space nonetheless, with a large playground area, so it's just good to know it's there, if you find yourself in this neighborhood. I am linking to a neighborhood report done by Monocle Magazine, because I think it will give you a nice sense of the area.